Welcome to an exciting new month here at the machaneh! Yesterday, the sun was shining, the birds were singing, and the campers were settling into their new tzrifim (bunks). With 31 tentative, but excited, chanichim (campers) in our aydah (age group), aydat Arayot looks to be more than capable of having fun while also leading the camp. After settling into the tzrifim, the boys and girls each played separate, quick icebreakers to get to know each other better before dinner. A lovely feast of pizza for dinner was followed by a very fun peulat erev (night activity) of Shark Tank. 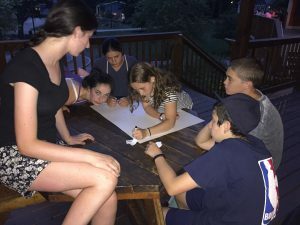 Based off of the reality TV show “Shark Tank,” the chanichim were split into groups and were given random problems or hypotheticals that can arrive in camp and had to solve these problems with random materials (sand, swimming noodle, grapes, etc.). The groups had to project their sales and profits, make a catchy jingle and name for the product they made, and present the product to the rest of the group! Though it’s only been one day, it’s very clear that Arayot wants to be here!